The four-day holiday-anniversary weekend was consigned to the status of staycation, due to … well, pick one: gas prices, economic malaise, inertia. Fortunately, staying put doesn’t mean that tourism and sightseeing opportunities are lacking. The summer season in Chicago offers a variety of ways to spend a week, a weekend or even an afternoon. This is not a tourism site, so we won’t dwell on all of the possibilities, which include the Cubs, the White Sox, the Museum Campus, the Art Institute, the wonderful again Museum of Science and Industry, Millennium Park and its free Grant Park Music Festival, and special events such as the ending today gorge-fest, Taste of Chicago. For many years, the non-profit Chicago Architecture Foundation has offered a variety of resources: tours, lectures and a museum. 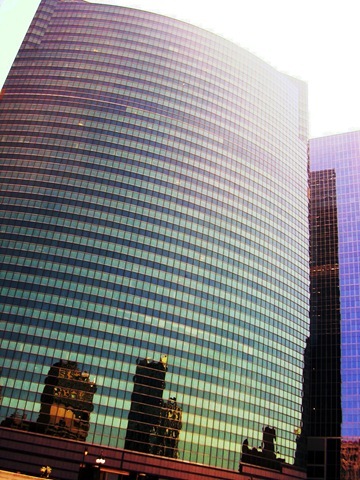 Chicago has always taken its architecture seriously, especially its breathtaking skyscrapers; Chicago considers itself the birthplace of the skyscraper. For a long time, until the world’s economic center of gravity began its shift away from the U.S. to Asia and the Middle East, Chicago’s Sears Tower was the tallest such structure anywhere. 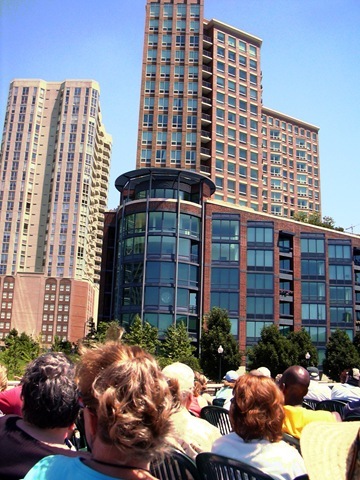 One of the Chicago Architecture Foundation’s most approachable products is the Architectural River Cruise. 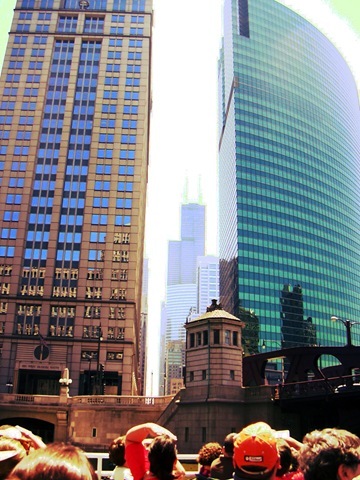 River cruises in Chicago are easy to find — just head down to Michigan Avenue and Wacker Drive between May and November. CAF’s are unique because they feature commentary by trained docents who aren’t simply mechanically reciting a script; they really care about what they are so enthusiastic to show you. We’ve enjoyed this cruise two previous times through the years; the last was perhaps 20 years ago. Wow, has Chicago changed in twenty years! So, we drove two miles to the terminal, parked the car for $2.00 in the recent garage (the entire terminal has been extensively rebuilt — finally! ), and rode the (air conditioned!) “El” train downtown, coming upstairs from the subway about 50 minutes after leaving home. When we arrived at the departure dock, we were about 30 minutes early. It was a good opportunity to find a bench and relax on the Riverwalk, a tree-lined corridor that’s been built on either side of the river in recent years, watching people stroll by, and the river traffic, mainly competitor sightseeing cruisers, many private motor yachts, and a covey of kayakers. 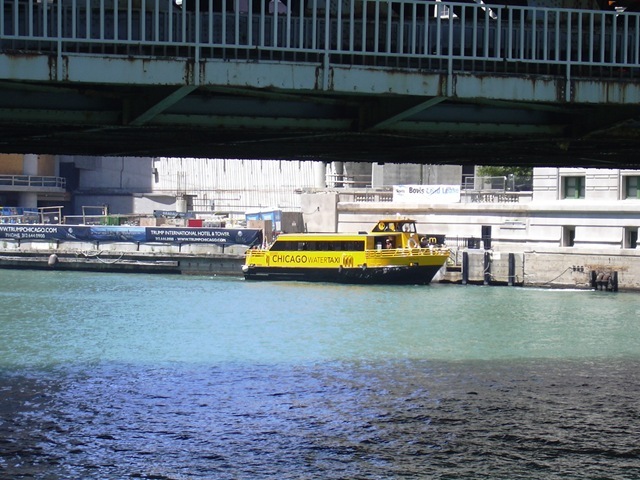 The bright yellow craft below is a water taxi, that makes a circuit between the train stations just west of the river’s South Branch, and this dock, just west of Michigan Ave. Finally, the 1:00pm departure time arrived, and we were off on our 90-minute cruise. There was lots to see. Yr (justifiably) humble svt’s very clunky and elderly Nikon Coolpix 2000‘s tiny 128MB memory card was in a race with my alkaline batteries as to which would poop out first. Fortunately, I conserved both, captured 131 images. Relax, you won’t see them all here. Today. But you will see some highlights. When this Philip Johnson structure was finished in the late 1980s, I believe, Chicagoans were put out that a New York architect had been hired for such a visible commission, at the three-way branch of the river. Today, everyone just loves it for the spectacular exercise in curved, mirrored glass that it is. At this point, the river splits to North and South branches; the tour goes north, first. An all but abandoned bridge, this one built for the former Chicago & Northwestern railroad, to get rolls of newsprint to the Sun-Times and Tribune (both downtown printing plants long since relocated to less expensive real estate). 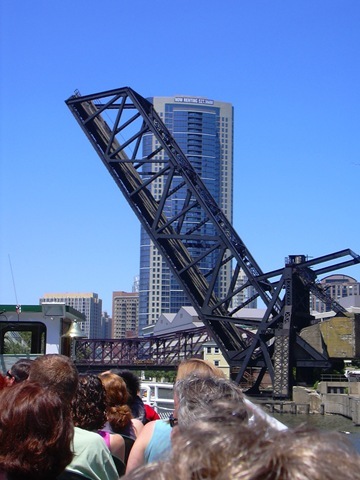 The bascule design is typical of Chicago bridges; there are more of those here than anywhere else. Once totally industrial, the North Branch of the Chicago River is more and more residential; here’s a recent example. Live on the river, walk to work. A very nice lifestyle for those who can afford it. As we crossed the intersection between the North and South branches, I caught this view eastward, from whence we had originally come. 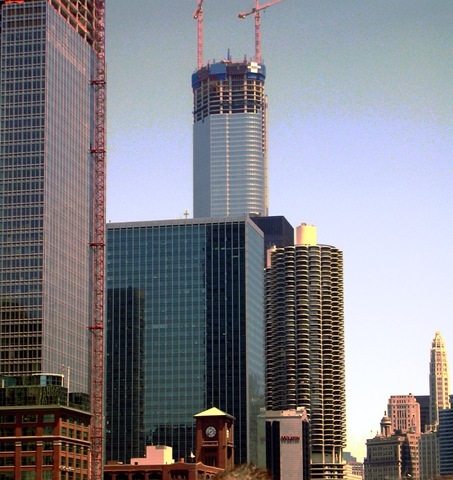 Behind one of the “corncob” Marina Towers (could be a subject for its own post) we see the Trump Tower, a first for Chicago. The winner of Trump’s first “Apprentice” series was to become this project’s manager — I have no idea whether that actually happened (reality show, indeed! ), or if so, whether the man is still connected to the building. But the multi-use structure is topped off, and the hotel at its base is in operation already, despite the high altitude construction above. 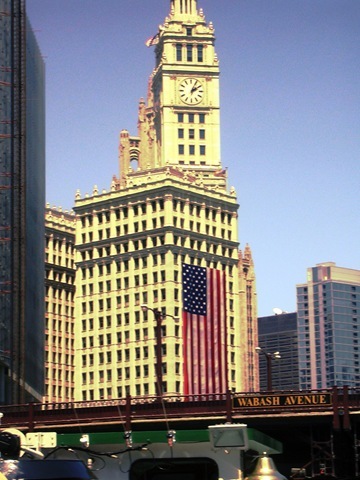 Inexcusably for an architectural photographer, I chopped off the tip of the tower of the Wrigley Building, a Chicago icon since it was built in the 1920s. But, it’s a holiday weekend, and the giant flag seems a suitably observant way to end today’s tour. Chicago is a very, very photogenic city, and it was a beautiful, sunny afternoon. I am a very untalented photographer (I guess it’s that elusive vision thing), with a very simplistic camera, but even Mrs. MUDGE was impressed by these, and many of the others that I might be persuaded to share. Some other time. Maybe. Tomorrow? This entry was posted on Sunday, July 6th, 2008 at 6:20 pm and is filed under Architecture, Chicago. You can follow any responses to this entry through the RSS 2.0 feed. You can leave a response, or trackback from your own site. Fairly cool post. I simply stumbled upon your weblog and wanted to say that I’ve actually appreciated reading your blog posts. Anyway I’ll be subscribing to your blog and I hope you submit once more quickly! I like to keep upto date announcing even though I do not really have an understanding of exactly what you actually explained. It’s not at all a similar we have found Parts of Asia. The natives possibly notice it a little bit diversely. I always wish to look for a strong International female mindset.